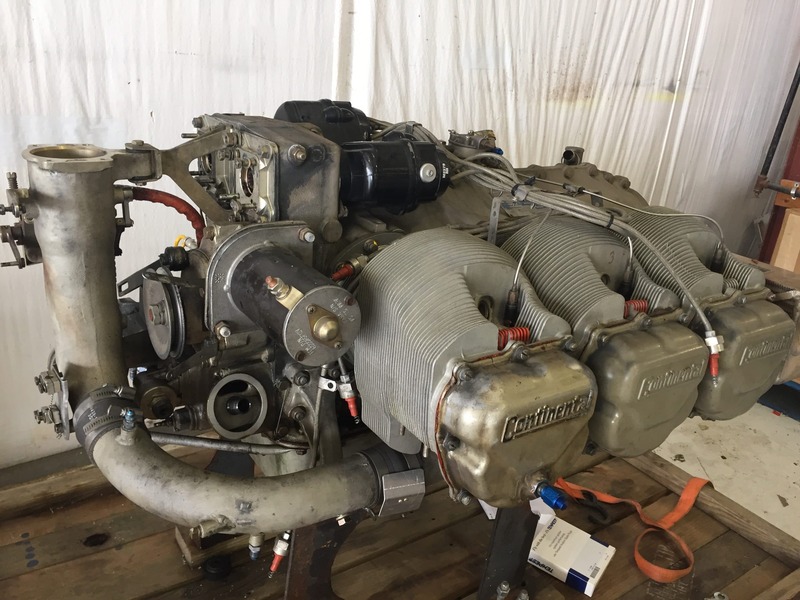 210 Engine Upsize | Tennessee Aircraft Services, Inc. Most of the new design high performance piston singles are based on the Continental tuned induction 550 series engine. Whether normally aspirated, turbo normalized or fully turbocharged, they are all rated at 310 horsepower. The previous generation of high performance piston singles typically used the Continental 520 series, which had a similar maximum power output of 300 horsepower. An industry presumption is that the new airplanes achieved all their performance enhancements due to their great new airframe technologies. Common sense suggests that assessment should be correct. However, a few adventurous entrepreneurs believed some of that new performance should be credited to the new engine. These creative thinkers believed the 550 series engine installed on a particular legacy airframe just might translate into big performance gains. As it turns out, the old 210 airframe gives the new kids on the block a run for their money when muscled up with the 550. Regardless of how fast our planes fly, we want them to go faster. The general rule is that it cost about one aviation financial unit (AFU – that’s one thousand dollars for single engine piston airplanes) per nautical mile per hour increase in cruise speed. The rule traditionally only applies to airframe modifications. Engine upgrades may add performance, but the buy-in cost is WAY more than one AFU per knot. It would be great to have a “ready to go” compression ignition piston engine (Diesel) for the 210 that would make a full 300 hp while sipping under seventeen gallons per hour. While we wait for that, we might also wish for a small turbine engine that cost less than the airplane. The diesel is made of unobtainium and the turbine of unafordium. So far, these heavy fueled engines for the 210 just haven’t made it to the mainstream. However, in the words of Alexander Pope, “Hope springs eternal”. 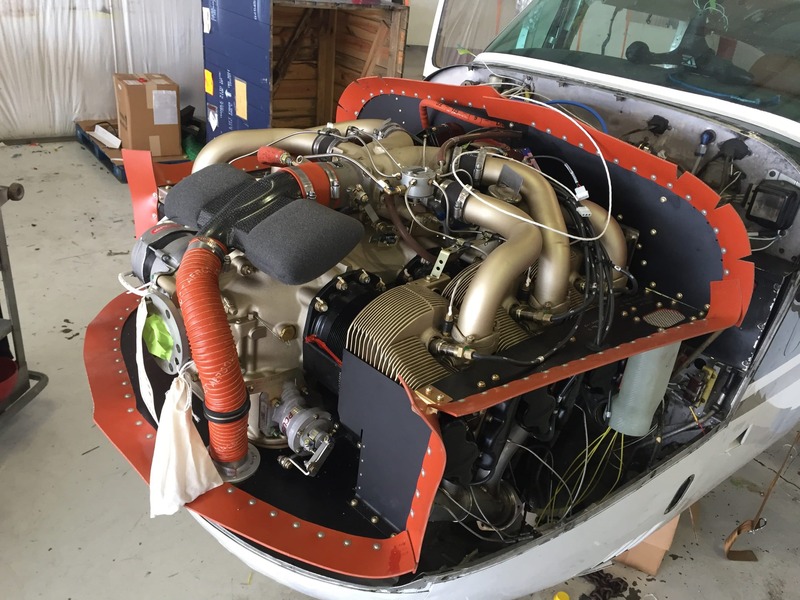 The original engine installed on the 210 airframe, when delivered from Cessna over thirty-two years ago, was either a turbocharged or non-turbocharged 520 cubic inch Continental with underside induction system. The current most popular upgrades are all based on a version of the Continental 550 cubic inch engines and come with highly modified installations. One company offers a conversion using the IO-550 with underside induction pipes, as used on the original 520 series engines. It can be installed on a normally aspirated airframe or on a plane that was originally turbocharged. There is some debate about the wisdom of de-turboing a T210, and there are arguments on both sides. The debates aren’t so much about the performance changes but more about future marketability of the de-turbo’d airframe. Another company offers two conversions, one turbo-normalized and one normally aspirated, using the IO-550 with an underside induction system. Either of these can be installed on a 210 that was originally turbo’d or normally aspirated. The turbo normalized version includes an intercooler for better engine breathing. A third company offers a normally aspirated IO-550 with overhead tuned induction. The conversion can be installed on airplanes that were originally delivered as normally aspirated as well as turbocharged. The de-turbo debate applies here as well. Finally, a bit more specialized conversion is designed by a company specifically for the turbo’d T210 and the pressurized P210. It replaces the TSIO-520 with an IO-550 but retains the turbo charging system from the TSIO-520. The turbo system is altered such that the installed IO-550 becomes a turbo normalized IO-550 with dual aftercoolers. I’ve purposefully have not referenced each company as my intent isn’t to advertise. The decision to upgrade is filled with many personal preferences and needs. I wouldn’t say that any one of these modifications is better than the others, but they all have their advantages and disadvantages. Added speed is the easiest upgrade to market and all the companies offering these upgrades use increased speed in their marketing. For engine upgrades, one shouldn’t limit exceptions to just more speed. Even though these different engines are still basically the same size and horsepower as the originals, they all do add some performance enhancements. All of the new options are high compression ratio engines with better efficiency than the old ones. All also include new cooling baffle design with intentional thought given to more efficient airflow. The turbo normalized upgrades include an aftercooler which Cessna didn’t install until the “R” model. The combination of these improvements add up to better overall performance. In my experience with these modifications, improved climb performance with manageable cylinder head temperatures is the most noticeable change. The 550 series do not suffer from the five minute limit on using their maximum available power. This allows for using everything the engine has to give for climbs. This has the biggest impact on the turbo normalized aircraft that can climb at about 1000 feet per minute all the way to the flight levels. This may sound crazy to some old school folks, but it actually makes perfect sense. The old 520 operated per the POH, with a personal limit of 400 degree cylinder head temperature, can only sustain about a 500 feet per minute climb. A climb to 18K’ at 500 FPM and 28 GPH with a 520 is way more gas and time than the same climb at 1000 FPM and 38 GPH with a 550. Cruise speeds are also enhanced, in part due to higher available power settings. The improved cooling airflow also enhances cruise speeds by reducing drag. Gone is the need to leave cowl flaps partially or even full open at high altitude cruise, a savings of at least five knots. More noticeable is getting the same or much better speeds at much lower fuel consumptions. These engine changes aren’t just a simple engine change. They include modifications to the intake systems, engine controls, cowling, exhaust and engine mount structure. These added efforts can stretch installation down time up to six weeks. Finding a suitable opening in your calendar that matches the installer’s calendar can be a challenge. Making the move in conjunction with a scheduled annual inspection will save some labor but not much. The time that makes the most sense is when you’ve determined the current engine must be retired. The upgrade will cost some multiple of a typical overhaul or rebuilt exchange, but at least it’ll include the already budgeted standard engine change costs. The time to upgrade is mostly determined by one’s desire to spend the money. I know that’s a cheeky answer, but it’s mostly true. This is the real question that everyone seems to want someone else to answer for them. I’ll intentionally not attempt to answer that question for you either. Everyone’s financial situation, flight profiles, and personal preferences are different, just as are the engine upgrade options. In a nutshell, the conversions using the 550 with the underside induction are the least complicated to install and lowest cost to purchase. Their footprint is almost exactly the same as the 520. The 550 with the overhead tuned induction is a very different installation with the throttle body in a totally new location. The labor to install is more than the underside induction 550 and requires significant modification to the cowling. The turbo normalized 550 conversion for the pressurised P210 is the most labor intensive and the most costly engine. It also provides the biggest improvement in overall performance. You’re on your own to decide which upgrade is best for you. Be careful about spending too much time with the spreadsheets. No matter which one you choose, it won’t make financial sense if you’re totally honest in your assessments. The best way to choose is to use the same logic you applied when making the decision to purchase the 210 in the first place.